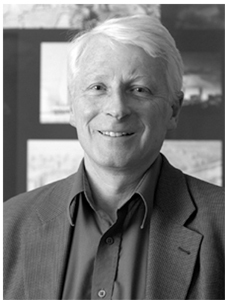 Edwin J. Rowse OAA, AAA, FRAIC, CAHP, RIBA is a registered architect in Canada with thirty years of experience in the field of historical architecture. He specializes in the renovation of existing buildings and in the conservation and restoration of historic buildings. After graduating from the University of Edinburgh, he worked in London, England, for nine years for Donald W. Insall and Associates, an internationally recognized firm of restoration architects. In 1984 he moved to Toronto, Canada, where he worked for two firms with heritage expertise before starting his own practice in 1990. He has been in partnership with Michael McClelland since 1994. The firm is well known for heritage planning and architecture, with projects ranging from the award-winning Distillery District and Carlu hospitality centre, both in Toronto, to the care of four national historic sites. ERA is also committed to promoting related cultural causes such as the revitalization of Allan Gardens in Toronto. His experience covers a broad range of historical building types, styles, construction technologies, and decorative finishes, including carving and gilding.